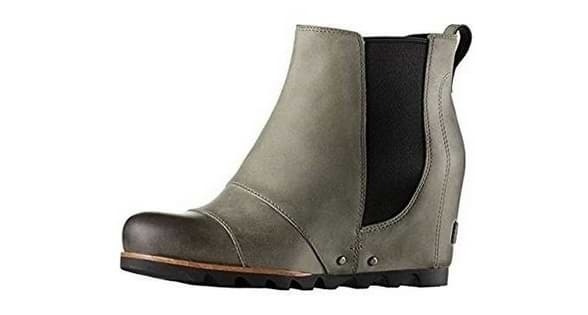 This smooth-faced bootie balances practicality with streetwise style, featuring a lugged wedge sole and a waterproof leather finish along with elastic-gore insets and a sleek cap toe. The removable cushioned insole complete with heel cup and arch support, as well as the soft microfiber lining, make sure you keep comfortable no matter what the weather brings. Shaft measures approximately 4" from arch. Sleek, comfortable and incredibly versatile, the beloved Lea Wedge is a best seller for a reason. Rich, supple waterproof full-grain leather seals out the elements, while the classic Chelsea stretch panels provide the perfect fit. The easy-to-walk-in wedge design is finished off with a high-traction molded rubber sole to take you anywhere. I've been wanting a pair of Sorel "Joan of Arctic" boots for a while, but didn't like the lace up so when I saw the Lea boot with no laces, I jumped on it. This boot has exceeded my expectations so far. I commute to Philadelphia for work and walk a lot, in different types of weather so I was looking for something waterproof/snowproof but stylish enough to wear with business suits. This boot fits the bill and will look great with jeans, too. The boots arrived and I noticed that initially they were tight in the mid-foot area, and I have a narrowish foot to begin with. However, I'm happy to report that after wearing them around the house for a day with a pair of socks, they are perfectly comfortable. I usually wear a size 8, sometimes a 7.5, I got the 7.5 and they are perfect.